This full salad meal is brimming with roasted vegetables and steak on a crunchy bed of greens. Heat oven to 425°F. Spray 15 x 10-inch baking pan with cooking spray. Place vegetables in pan; spray generously with cooking spray. Drizzle with vinegar; sprinkle with garlic, rosemary and salt and pepper. Stir to coat. Roast in 425°F oven 30 to 35 minutes or until tender, stirring once. Cool slightly. Heat large nonstick skillet over medium heat until hot. Place steaks in skillet; cook top loin steaks 12 to 15 minutes (tenderloin steaks 10 to 13 minutes) for medium rare to medium doneness, turning occasionally. Remove; let stand 10 minutes. Carve steaks; season with salt. 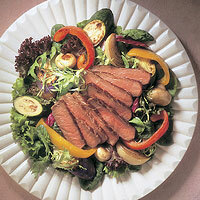 Arrange beef and vegetables on greens. Serve with dressing.